If you only wish to be informed on Congress news or if you later wish to submit a paper please fill in the Congress Application Form. You will receive a personal password which will give you an access to your personal user pages. Contributions will be presented as keynote lectures, lectures, or posters. As lectures, preferably papers with a wider scope or importance should be submitted. Authors should indicate the preferred form of presentation but the Scientific Committee reserves the right to make the final decision. The Congress language is English. Try to arrange your poster in such a way to provide a clear comprehensible image of your work at first sight even for those participants who are not conversant in your special field of interest. Give preference to diagrams, pictures and charts. The text should be very concise and accentuate the particular aim of your work, its importance, application, and the key formulas and symbols. Leave details to the discussion with interested people. The size of the poster board is 130 cm (height) by 96 cm (width). The presenters will mark their posters with a heading, containing the title (size of letters 4 cm, at least), and the name(s) of author(s), affiliation, city and country (size of letters 2 cm). Letters under 1 cm are not suitable. Posting only a printout of the full text does not do credit to the sense and purpose of poster session. The presenters will arrange their posters at designated panels before the beginning of the poster session and remove them immediately after the closure of the session, i. e. at 17 h.
Since the oral sessions are based on rigid time schedules, a regular lecture including discussion can last no longer than 20 minutes. Forty minutes are usually reserved for keynote lecture. Data projectors. Lecture rooms will be equipped with data projector/PC with PowerPoint software (version 2003 and higher). We are not adapted for Macintosh software. A PC for checking the PowerPoint presentation beforehand will be available in the Congress Reading Room. A connection to Internet will not be available in the lecture rooms. The lectures should be presented in English. Kindly use short sentences, a slower pace of delivery and clear and distinct pronunciation. This concerns specifically those presenters who speak in their mother tongue (i.e. English). Although the deadline for oral presentation has passed, additional contributions can still be accepted (mainly as posters) up to the beginning of the Congress but only those received by 31 May 2018 will be included in the final program. Application for presentation of a paper must be submitted only with use of the Application Form. Every application must be accompanied by 1–2 page summary in English (observe kindly instructions for preparation below) uploaded with the interactive application form. Application form without summary will not be considered. The summary should be comprehensive and suitable for reviewing by members of the Scientific Committee. Important note: only one oral and two poster presentations are allowed for one registered (and paid) participant. Author of accepted contribution has received an e-mail message confirming the acceptation. All additional contributions are summarised in the Additional Papers. In this table are also included papers which are still in the process of acceptation. Papers after their acceptation will be regularly (say: biweekly) transferred to the List of Accepted Papers. Presently the table contains papers which were accepted by 5 March 2018. Author may update (as many times as necessary) the original summary via her/his user page before 31 May 2018. It is assumed that the title of the contribution will not be thoroughly modified. In case you wish to modify anything, go to your user pages, in the menu select button “Inspecting submitted papers” Then, please download (by clicking on the title) your summary which is already edited in the database. Now, you can modify the summary and to re-upload the corrected version. In this way we shall avoid re-formatting the summary again in order to be compatible with the rules. Re-upload will automatically notify the administrator of database about some change. This is also the easiest way how to announce correction of the title, authors, affiliations, etc. Information contained in the summary is the only source of data for the final program. The final version of summary must be received before 31 May 2018. Please do not upload the summary if nothing has been changed. At least one of the authors must register as a participant and settle her/his registration fee before 30 April 2018 otherwise the paper will be withdrawn from the program. Authors not intending to submit a paper to the congress special issue journal, or the authors whose contribution is not accepted for publication, are free to publish their papers at will after the congress. Traditionally, CHISA 2018 offers to all participants publishing their contributions as full papers in two impacted international journals as follows. All submitted papers will be subjected to the standard peer review process. 1. Chemical Engineering and Technology (John Wiley). This CHISA 2018 special issue is understood as the Congress profile journal. It is expected that presenters of 80 CHISA lectures and posters will be approached after the congress closure (before 14 September 2018) with the pre-nomination appeal. The gate for submissions of manuscripts will be open since 14 September 2018 for the next four weeks. About 35 outstanding papers will be then selected from pre-nominations on the basis of standard peer review process. Editor of this special issue will be B. Böck (Editor-in-chief, DE). 2. Chemical & Biochemical Engineering Quarterly (Croatian Society of Chemical Engineering). The CHISA 2016 special issue of the journal is open for all topics from chemical and biochemical engineering. It is expected that interested presenters of CHISA lectures and posters will be approached before the Congress starts with the pre-nomination appeal. The journal will accept manuscripts since 14 September 2018 during the following four weeks. There will be about 20 papers finally accepted for publication after standard reviewing procedure. Guest Editors of the special issue are G. Bogdanić and I. Wichterle (CZ). Abstracts for PRES 2018 will undergo peer-review over December and January with abstract acceptance notification sent out by 31 January 2018. PRES manuscripts, limited to 6 pages to prevent similarity with the future publication of full-size papers, are due 16 March 2018 with revisions and final acceptance completed by 30 April 2018. Chemical Engineering Transactions. Paper templates for CET and conference proceeding (non-CET) publications will be available here by 31 January 2018. CET is covered by SCOPUS and ISI Thompson Reuters. Full-text manuscripts must undergo a full peer review by at least two reviewers and must be prepared according to the CET template and submitted together with the signed Copyright Transfer Authorisation. Each paper will be available online open-access and assigned a DOI by AIDIC. For publication in CET, papers must have at least one registered author and settled any additional publication fees (e.g. second paper) by the required deadlines. PRES 2018 aims to publish Special Issues of the following journals to report on extended contributions presented at PRES 2018. Journal of Cleaner Production, IF (2016) = 5.651, Elsevier – invitation for 40 papers. JCLEPRO serves as a transdisciplinary, international forum for the exchange of information and research concepts, policies, and technologies designed to help ensure progress towards making societies and regions more sustainable. It aims to encourage innovation and creativity, new and improved products, and the implementation of new, cleaner structures, systems, processes, products, and services. Co-Editors-in-Chief: J.J. Klemeš (CZ), C.M.V.B. de Almeida (BR), and Y. Wang (CN). Energy, IF (2016) = 4.968, Elsevier – invitation for 40 papers. Energy provides a platform for publications geared toward energy saving and pollution reduction from the entire value chain in energy sourcing, generation, supply, and use. Energy is an international, multi-disciplinary journal in energy engineering and research. It aims to be a leading platform and an authoritative source of information for analyses, reviews and evaluations related to energy. The journal covers research in mechanical engineering and thermal sciences, with a strong focus on energy analysis, energy modelling and prediction, integrated energy systems, energy planning and energy management. Editor-in-Chief: H. Lund (SE), Subject Editor: P. S. Varbanov (CZ). Renewable & Sustainable Energy Reviews, IF(2016) = 9.184, Elsevier – invitation for 30-40 papers. Renewable and Sustainable Energy Reviews publishes review papers, original research, case studies and new technology analyses that have a significant review element, which may take the form of a critique, comparison, or analysis. Editor-in-Chief: A. M. Foley (UK). Energies (Open Access – required for Horizon 2020 projects), IF(2016) = 2.676, published by the Multidisciplinary Digital Publishing Institute (MDPI) – invitation for up to 30 papers. Energies (ISSN 1996-1073) is an open access journal of related scientific research, technology development and policy and management studies. It publishes reviews, regular research papers, and communications. The subject areas include a wide spectrum from fundamentals of energy conversion and modelling, up to technology and policy issues. The full scope can be found on the following web page. Editor-in-Chief: Enrico Sciubba (IT). The contest for the best poster at PRES 2018. All posters will be considered and judged under the following criteria: originality of the research; originality of the topic; clarity of the presentation; graphical quality; oral presentation and discussion with the Poster Evaluation Board. Authors of the best three posters will receive a Certificate. The Second Circular with the preliminary program and the Registration Form for participation will be available in March 2018 on this website. 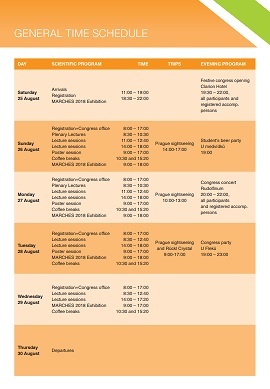 Congress materials, opening banquet, congress concert and student beer party are included in the registration fee. Authors pay the same registration fee as participants without contribution. At least one of the authors must register for participation before 30 April 2018. Be aware that the application for a paper presentation does not represent automatically the registration of a participant. Registration form is available here. The registration fee will be refunded (with a deduction of 10 % to cover the handling costs) if participation in the Congress is cancelled in writing before 25 July 2018. No refund will be granted after this date. Price "double" is the price for two persons in one room. Clarion Congress Hotel Prague (congress venue) is a four stars hotel which offers comfortable accommodation in the wider centre of Prague. It is the only hotel in Prague providing relaxation shopping facilities under one roof - all that with direct entry to the Prague Metro and connection to other means of city transport. Pivovar Hotel (in English Hotel Brewery) is 3* hotel just 300 m from congress venue. The new, modern building offers accommodation on two floors in 46 modernly equipped rooms with en-suite bathrooms at a three-star standard. In this building you can also find the reception, dining room . Guests can take advantage of the hotel's guarded outdoor parking lot and garage, a bar and two restaurants offering both Czech and international cuisine. Throughout the hotel there is free WiFi. The hotel has excellent transport connections. Vysočanská Metro station as well as bus and tram stops are less than 300 metres away. The journey by Metro to the centre takes approximately 12 minutes. There are also two large shopping centres close to the hotel. The deadline for application for oral presentation has been prolonged till 15 January 2018!